Almost all the air around us is moist. That means that it contains water in the form of vapour. You can't see it because water vapour is a gas, but it's still water. Water can exist in three states; liquid (water), solid(ice) and gas(water vapour). Obviously, you can see and touch water and ice, but water vapour has no smell, you can't pick it up, and it's invisible. That doesn't mean that you can't feel it though. Perhaps you can remember a hot and sticky day in summer, or a cold foggy day in winter, or even being in a hot shower full of steam? In each of those situations you will have felt water vapour all around you. If you stopped at really looked at that fog or steam you would have spotted millions and millions of tiny water droplets floating in the air. What you saw was the same process that makes clouds - millions of tiny water droplets condensing out of the air to form liquid water. We've all seen fog and steam, but why does water condense out of air and become visible? Well, warm air can hold more water vapour than cool air, so if warm air starts to cool, it can no longer hold as much water vapour. The extra water vapour has to go somewhere, so it condenses out as water. So... cooling the air reduces it's ability to hold water vapour, and triggers the formation of water droplets. Remember that bit, 'cos it's very important. To become heavier, the droplets need to grow into drops. To do this they have to acquire more water and become larger. Some will collide with other droplets and become larger, and others will grow as water condenses out the air directly into the droplet. Others will grow by both methods. It's a bit like watching drops of rain water on a window - small drops fall, they join with other small drops, become larger drops, and so on. In the right clouds, this process will be happening to millions of tiny droplets, all growing at the same time, but at different speeds. Eventually, if the droplets keep growing, they will reach a mass where they can't stay floating in the cloud because they are too heavy - and will start to fall. Some may get caught in upward blowing winds and get blown back into the clouds for a while, but once they are heavy enough to overcome the force of the wind, they will fall to earth - as rain! It will keep raining as long as the conditions are right to make the clouds and let the water droplets grow heavy enough to fall. The next thing is to discover what causes the air to cool and start the process. Earlier on I mentioned (and told you to remember it) that cooling the air reduces it's ability to hold water vapour, and triggers the formation of water droplets. 1) On a warm day the sunshine heats up the ground. Air above the warmed ground also becomes warmer, and it begins to rise (because warm air is less dense than the air around it). As it warms up it absorbs more water because, as you should remember, warm air can hold more water than cool air. 2) The atmosphere gets cooler as you go higher - by roughly one degree centigrade cooler for every 100m of altitude in dry air - so as the warm air rises it becomes cooled again by the colder air around it. 3) Eventually the air reaches a height where the temperature forces the water vapour in the warm air to start condensing. 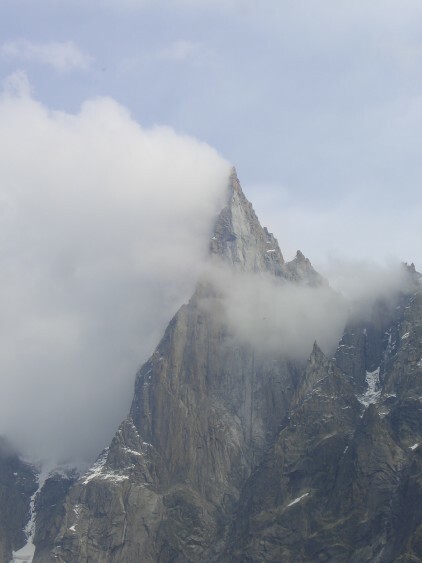 This is called the condensation point, and is where the clouds begin to form. The typical cloud formed this way is called a cumulus cloud, or a cumulonimbus cloud when it has a grey bottom and 'looks like rain'. 4)The rain forming process starts, and usually leads to very heavy rain, perhaps with thunder and lightening. 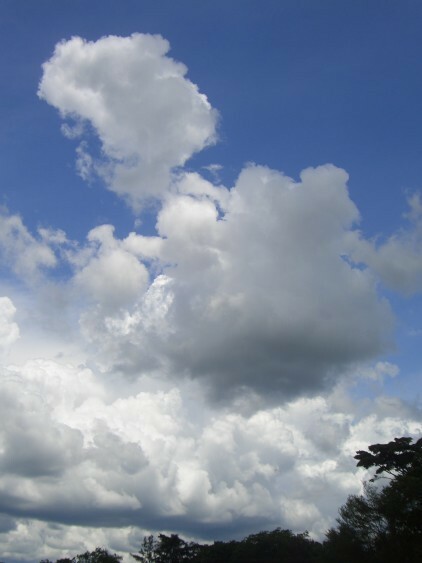 Convectional rain is often experienced at the end of a hot summer day and associated with torrential downpours with large drops and towering dark grey clouds. In Summer months, look out for clouds forming over fields of corn, large carparks and concentrations of buildings. All these features heat up quickly and cause warmed air to rise. If you are lucky, you may be able to watch a towering cloud forming in a matter or ten minutes or so. 1)Two bodies of air are involved - an area of relatively warm air and an area of relatively cool air. 2)The warmer air is less dense, so when it meets the cooler air it rises up over the cooler air mass. The cooler air stays where it is, and lies underneath the warmer air. 3)As the warmer air rises over the cold air it starts to cool. 4) As the air cools, water vapour is precipitated and the cloud forming process begins, leading to rain. Sky's are typically grey and cloud covers almost all the sky. 1) A physical obstruction of some kind is needed, so that warm moist air is forced to rise up over it. Mountain ranges, big hills and even cliffs along the coast be large enough to force the air to rise. 2) As the warm air rises over the obstruction it cools and clouds form. 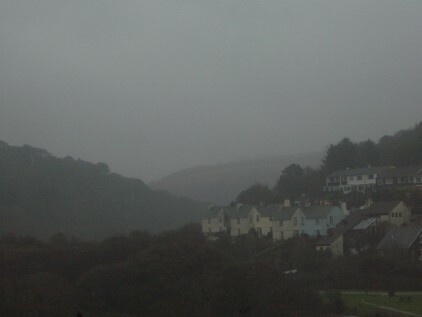 Rain falls from the clouds, or if the droplets don't grow large enough, fog may form over the hill tops. Fog is basically just clouds at ground level. 3)The air passes over the obstruction and can sink again, gaining warmth as it does so. This air is drier than it was before it lost water as rain, so any clouds left will evaporate again, leaving clear skies. This area has only a little rain because the cloud making process isn't working. Because there is so little rain, the area is said to be in a 'rain shadow'. Relief rain is common in upland and mountainous areas where is can lead to extraordinary local rainfall patterns. It's common for one side of a mountain to be in warm sunshine, yet only a few hundred meters away it's raining on the other side of the mountain ridge. This can be important to the development of settlements, agriculture and tourism. For example, in summer most people want to be on the sunny side of a mountain with little precipitation, but in winter, when rain is replaced by snow, they want to be on the side where the precipitation does fall. 1) A popular area in North America that sees complex weather patterns when it comes to precipitation is Colorado. Mountains, hills, plains and desert land combine to make up the state of Colorado. The mountains have a marked influence on the climate and weather of the area, producing both relief rain and a rain shadow zone. While some parts of the state see extreme weather changes, other areas, such as Denver, can experience very low levels of rain fall and sunny days all year round. Denver is a top tourist location and has also become a very popular location for business to expand. The city is also home to some top hospitals and medical facilites including Denver LASIK, a vision correction center for those struggling with vision and eye complications.